Over on Where’s my backpack?, Ailsa has posted this week’s theme for her Travel Photo Challenge: Secret Places. Our story begins in 1956, with one of history’s most famous maritime disasters. In thick fog on the evening of 25 July, the Italian luxury liner Andrea Doria collided with the liner Stockholm and next morning sank off Nantucket. 52 people died. Among those hoping to strike it rich was a Brooklyn Navy Yard ship fitter named Jerry Bianco, who developed a bold plan: build a submarine. Bianco believed he could build a vessel strong enough to descend to 240 feet of water, where the liner rests at the bottom off Nantucket, and could actually raise the sunken vessel by filling it with inflatable dunnage bags; when filled, the bags would lift it off the bottom or to the surface — or so the theory went. Lest this sound crazy, Bianco did succeed in forming a corporation, selling stock, raising more than $300,000, and building a 40-foot, 83-ton submarine that passed Coast Guard inspection with flying colors, and, in October 1970, was ready to be launched. But for want of a nail… Bianco was chronically short of money (he painted the submarine chromium yellow, because that was the cheapest paint he could find). Because the launch was to be paid for by the pound, he did not ballast the submarine fully, and it capsized upon being lowered into the water. And there it has remained ever since. 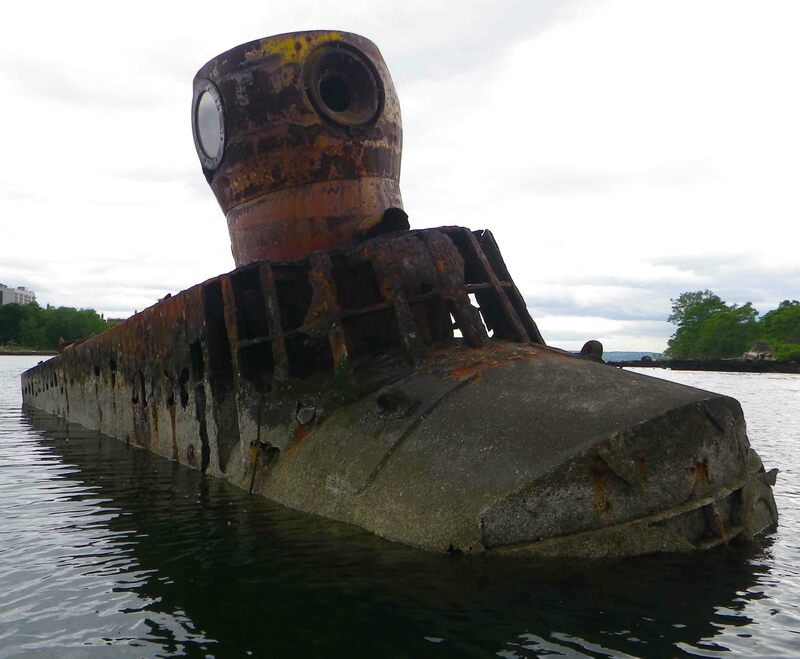 By now, not much of its yellow paint remains; it’s half-submerged, rusted, barnacle-encrusted… a modest, curiously-shaped object that nevertheless hides a fascinating history. 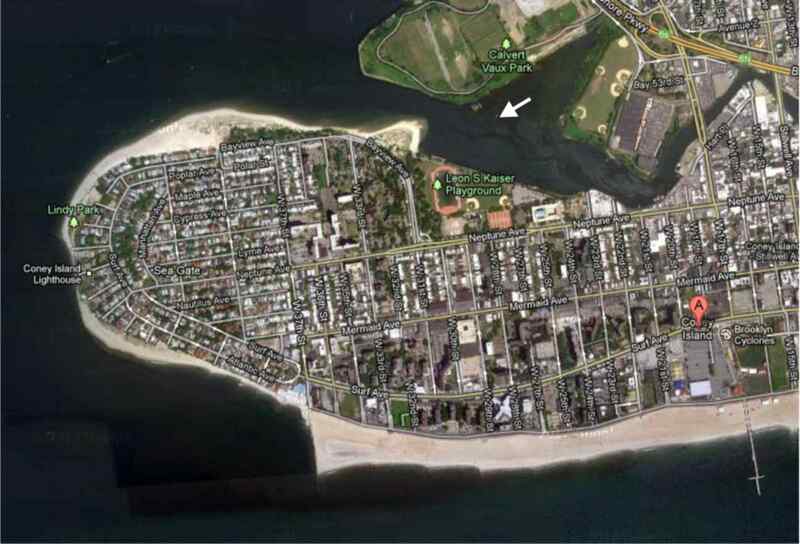 It’s in Coney Island Creek, a bucolic backwater of New York Harbor visited only by birds, fishermen… and kayakers! But not many know about it. We didn’t for many years. But now that we do, we visit it often. It’s one of our secret places. These photos are from a visit just last week. The text above is partly adapted from a previous post on the Yellow Submarine. And a nice New York Times article on the submarine and its location is here. 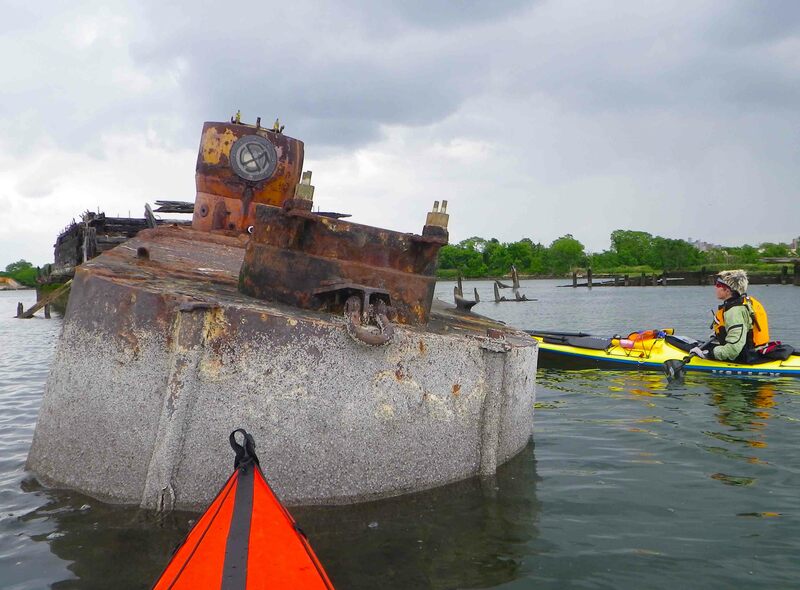 This entry was posted in New York City, Science and Technology and tagged Brooklyn, Coney Island, Kayaking, New York City, New York Harbor, Photography, postaday, postaweek, postaweek2012, Secret Places, Submarine, Travel, Weekly Photo Challenge, Yellow Submarine. Bookmark the permalink. It’s round the back of Coney Island, off Gravesend Bay (at the tip of the white arrow below). It’s clearly visible on Google Maps’ satellite view if you zoom in. Well, next time I’m in brooklyn, it’s my first stop.. Thanks for the story. I wondered about it when you posted your visit kayak photos. Now you know the full story! OMG, really surprising @Val. Chapeau! Very cool. How did I never knew about this? Defintely near the top of my list for places to visit this summer! As for the silver mermaid she’s with me! How did I live in Brooklyn for five years and not know about this? I wasn’t far from CI. V Cool. There are lots of surprising things that only a few know about in many corners of NYC… one of the things that make the city so fascinating! This is such a fabulous story – can’t wait to show it to my husband – thanks for sharing it. 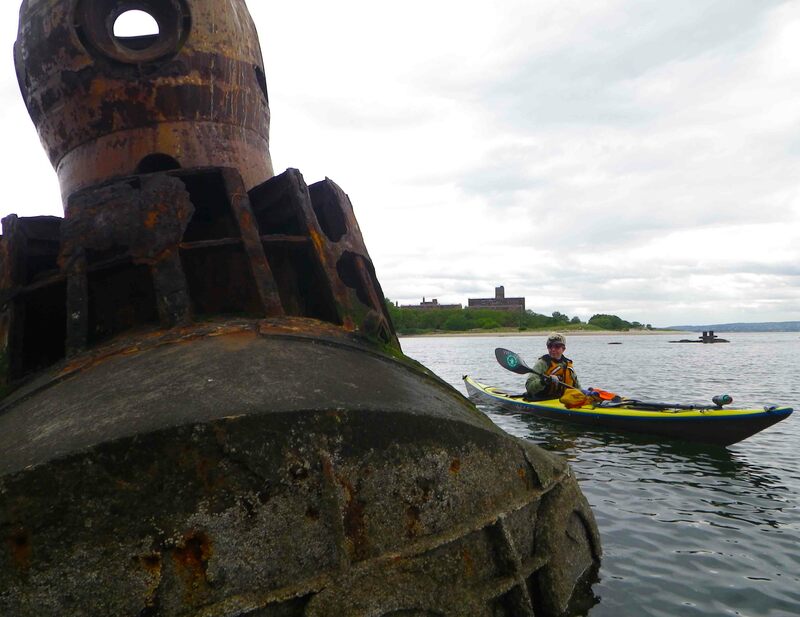 We’ve found some great things kayaking smaller waterways – but nothing like this! 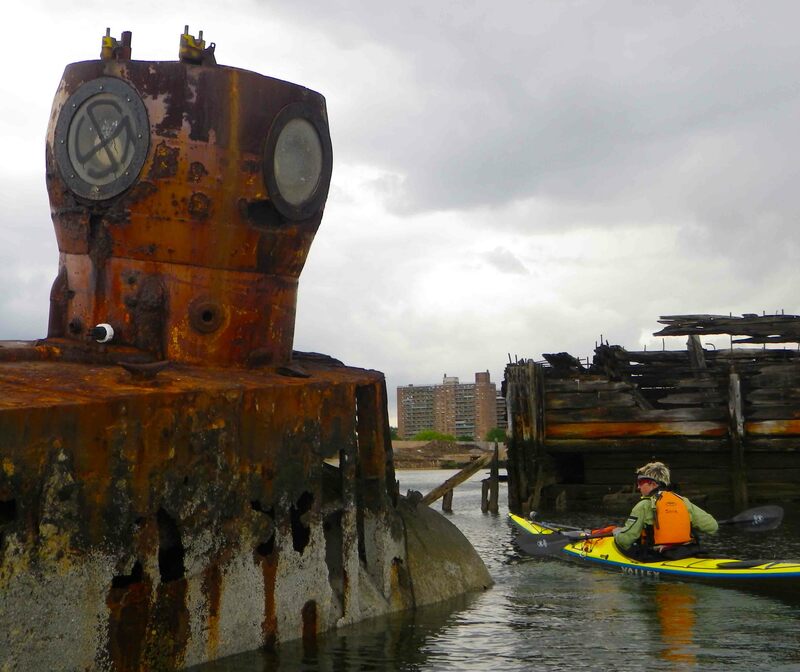 Vlad (I’m calling you that, hope you don’t mind), kayaking surely is unearthing some treasures around NY harbor – and gets added to my list of places to see and things to do in NY! Thanks. Thanks Vlad – I’ll definitely try to see the Yellow Submarine before too long. I thoroughly enjoyed your story about the yellow submarine. fascinating story and great photos. Thanks, Lisa—glad you enjoyed it!